Medela’s PersonalFit™ Connectors are engineered, tested, and approved to work specifically with your Medela breast pump and seamlessly attach to all PersonalFit breast shield sizes. Understanding your breast shield size and ensuring a proper fit is essential for both comfort and optimal milk expression – These PersonalFit Connectors were designed for seamless integration with your PersonalFit Breast Shields and breast pump. 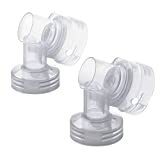 Note that these breast shield connectors are NOT compatible for use with Freestyle, Swing, Harmony, or single deluxe breast pumps. These authentic Medela pump parts and all other Medela products that come in contact with breast milk are made without BPA, for the added peace of mind that moms deserve. Maximize your pumping efficiency with Medela’s PersonalFit Breast Shields and accompanying PersonalFit Connectors, so you can continue to pump with comfort, efficiency, and convenience while providing your baby with breast milk for as long as you choose. Interested in the Medela Spare Parts, PersonalFit Breast Shield Connectors, Authentic Medela Pump Parts, Compatible with Most Medela Breast Pumps, Made Without BPA? Is the price too high? You can easily price watch this product and we'll notify you when the price reaches your target.